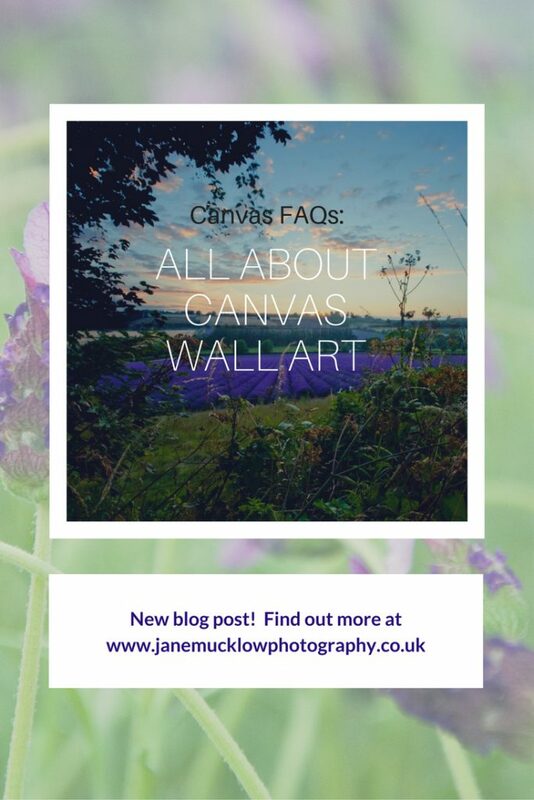 What exactly is a canvas print? Canvas prints are made by digitally printing onto a canvas fabric, which is stretched over a concealed wooden frame, to create a piece of lightweight and stylish wall art. Why choose a canvas print? It means your wall art hangs directly onto the wall, without a mount and frame surrounding the image, so there is no border between the picture and the wall. The canvas adds a little more texture to the image, over a flat photographic print. A canvas has more depth to it, and will stand out from the wall more than a framed print. My printers are a UK based, family business, making beautiful high quality canvases. Choose a photo that you love, and enjoy it on your wall for years to come. What is a canvas print made from? The company that makes my canvas prints uses 100% pure cotton artist canvas (415gsm), in brilliant white, to produce bright clear prints. They use genuine Epsom inks (Ultra Chrome K3, with a 9 colour system and 4 shades of black, which they believe are the best on the market) to bring my photographs to life with the most vibrant colours (and are guaranteed for 75 years for not fading!). They use the highest resolution printing possible, (2880 x 1440 dpi), with the best quality printers possible. The wooden frames are pine, which is sourced from a managed forest. What will my canvas look like? As a standard, I have my canvases printed with the photographic image reaching right up to the edges of the front. The sides of the canvas are white (but this can be changed on request, see below), and have a depth of 1.75″ (0.75″ is also available if you request it specifically, see below). What canvas sizes can I have? I have some standard sizes available on my shop page, but if you have a specific space to fill, or just want something different, then do get in touch for a quote. I order new canvases as required, so they are always fresh for you, and so different sizes are possible. See just below for standard sizes and prices. Which photographs can I have printed onto canvas? All my photographs can be printed onto canvas as well as photographic prints. (A few, especially older images, won’t suit being blown up onto really big canvases, but most will be fine, and if I expect a problem with your choice and size, I will let you know). All those I have picked for the website galleries on my website will look just as amazing in any of the standard sizes, and probably bigger. I do have many more images on top of those shown in the galleries, and you are welcome to choose from these too – I am gradually adding them to folders on Pinterest and my portfolio galleries on Pixieset, or you can see a wider selection if you find me at a fair or market (see the current list of booked events here). I can usually have a new canvas print with you in a few days to a week. My printers have a very quick turnaround during working days, and depending on your location I will then either post it on to you or hand-deliver. If there will be a delay I will let you know on receipt of your order or as soon as possible. How do I hang my canvas? Hang your canvas away from any direct heat sources, moisture, or sunlight. When handling your canvas, take care not to scratch the photograph with fingernails etc., but hold it on the wooden frame inside. Avoid hanging above a radiator, in the sun, or in areas of high/fluctuating humidity such as bathrooms and kitchens. There are a few methods for hanging your canvas up. The simplest is to bang a nail into the wall (or two for a bigger canvas), and hang the wooden frame over the nail. Allow for the depth of the frame when placing your nail, and if using two nails then ensure they are level so that the canvas is too. Method two is to screw a D-ring attachment or a screw eye to either side of the canvas frame, around a quarter down from the top, and attach string or wire between the two. You then just need one nail in the wall to hang it from, and the canvas can be adjusted to straighten it up. Alternatively you can purchase a picture hanging kit from a DIY store/online, attach the square bracket to the centre of the back of the canvas, and the picture hook to the wall, then hang the canvas onto the hook. Whichever method you use, make sure there are no cables or pipes etc. in the wall before you bang any nails in! Measure carefully so nails go in the correct place. It helps when deciding where to hang, to have someone else hold the picture up against the wall, so you can check from the other side of the room, and from the sofa, that it is where you want it to go. How do I look after my canvas? Canvas prints simply require a little dusting now and then! Use a feather duster, or a soft dry cloth. Don’t use any chemicals, or damp/wet cloths. Store it flat, with nothing on top, and away from any damp or high humidity areas if you aren’t hanging it straight away. What depth can I have my canvas? The standard depth to my canvases is 1.75″, so this is how far out from the wall it will stand out. (My printers do a shallower depth of 0.75″, so please request this on your order if you would prefer this). Can I have a different colour wrap? My canvases come with a white wrap as standard, ie the side edges are white (the photograph completely covers the front). However, when I order your canvas, I can change this if you prefer, to a mirror wrap (the sides mirror the photograph), black edges, gallery wrap (so that the photograph itself wraps over the edges – but you then lose some of the picture from the front), or a colour can be picked out from the photograph. Just let me know if you prefer any of these options when you order. Can you do split canvas prints? Yes I can! This is when a single photograph is printed across two or more canvases, which are then hung next to each other, with a small gap, to make up the bigger image. It would suit my panorama images, which could be split into three squares, or two landscapes; or my landscape images could be split into two or three portraits. Let me know which photograph you would like, and what sort of size you would like, and I will check that it is suitable.